Well, the field of view, 122m @ 1,000m, compares very well with most binoculars in the same size and price range. Importantly, it feels wide too, excellent for extended scanning of a wide area. The image is more than bright enough, with the colour generally appearing very natural (there was maybe a slight ‘icy’ feel). The optics did very well in low light, too. There’s a little softness at the edge of the image, but generally you get very full value for that wide view I was talking about earlier. The literature that came with them claimed impressive contrast due to their new ‘eco glass’, and they fully lived up to that. They resolve well at all distances, although perhaps at extreme ranges I found myself searching for slightly more punch. Try as I might, I struggled to find any colour fringing, even against a strong light. The focusing action is smooth and precise – I rarely found myself having to work hard at getting the image right. The focus wheel is smooth, and one finger wide. It offers just enough resistance for my liking, and takes 1.5 anti-clockwise turns from close focus to infinity. The close focus is absolutely outstanding – the quoted figure is 2m, but I comfortably got down to very near 1m, probably the best I’ve come across. I wasn’t keen on the eyepieces, although the silicon covering makes them very comfortable. The fold-out flaps to eliminate side light work well enough, but you’d have to fold them down if you were a spectacle-wearer. Although the eyepieces twist up and down to four positions, some of those positions felt a little indistinct, and in trying to move them the silicon covers moved a little too easily. Not a major gripe, and no doubt easily solved in the long term. They feel great in the hand, solid but slim and well-balanced. The rubber armouring is excellent, and the thumb indents well placed for comfort of use. The dioptre adjustment, on the left barrel, is not calibrated but was easy to set correctly, and stayed in place well under extended use. There’s a very comfortable neoprene strap, which fits incredibly quickly and easily thanks to a simple ‘ClicLoc’ device. The carrying case and rainguard are good quality. The tethered objective covers stay out of the way, and although I’d probably remove them in the long run, they did their job well. My only real worry was about those eyepieces, but I wouldn’t let that distract me from the fact that these are an optically very impressive pair of binoculars for well under £500. They did well in all conditions, and that superb close focus performance is well worth taking note of if dragonflies, moths, butterflies and insects are your thing too. 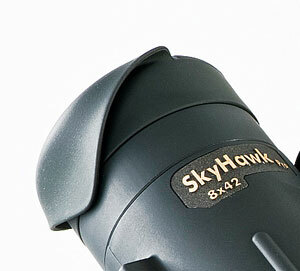 They feel good, too – robust but very, very pleasant to use on a long birdwatching expedition. A well-judged refinement, rather than a reinvention.